While changing the outcome and meaning of Bernard Malamud's novel, the film version still conveys its spirit. Roy Hobbs, portrayed by Robert Redford, dreams of being the best there is in baseball and, in 1939, becomes a 35-year-old "rookie" for the New York Knights. 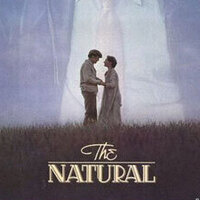 Glenn Close, Robert Duvall, and Barbara Hershey star in the film which features pastoral theme music from Randy Newman and excellent slow motion photography.